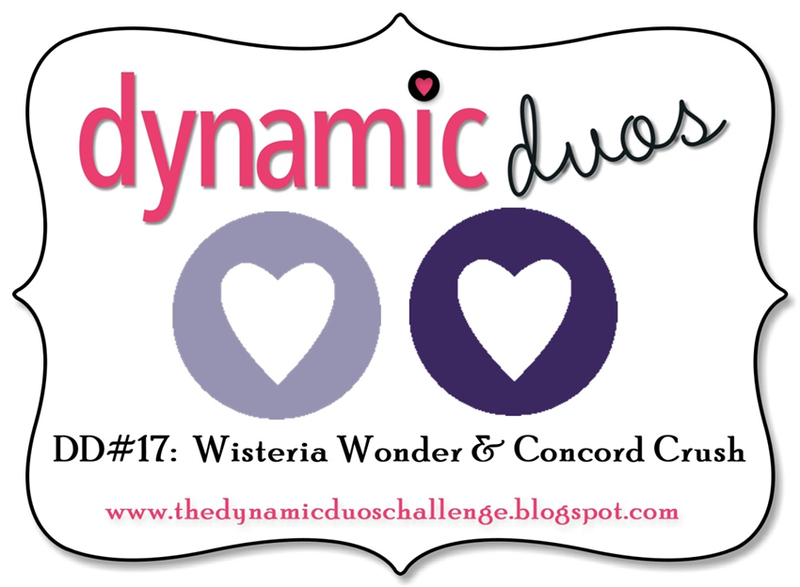 We are having a monochromatic challenge at Dynamic Duos this week. 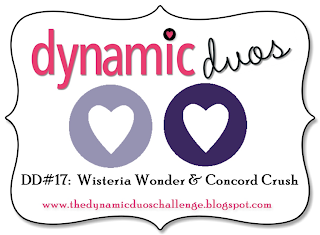 Our color duo is Wisteria Wonder and Concord Crush. Purple is on of my favorite colors, and I am a huge fan of sending purple Christmas cards! I did have Wisteria Wonder in my paper stash. Sadly, no Concord Crush. None of my other purples seem to fit into the right shade. I ended up adding several layers of Wisteria Wonder ink to white cardstock to get as close as possible to Concord Crush. When the ink was wet, it looked to be a perfect match. Fast forward ten minutes and it dried to a slightly light shade. I still thought it was dark enough to get the effect of the light and dark purple. Feel free to come up with your own combination of light and dark purple for your monochromatic creation! The red outlines around the images indicate that there is a shape on the Art Philosophy cartridge that coordinates with the image. My purple bow was made with Color Ready Seam Binding Ribbon and Wisteria Wonder reinker. Do you buy a reinker when you purchase your ink pads? I highly recommend purchasing a reinker whenever you purchase an ink pad. Reinkers can be used for far more projects than just reinking your ink pad. If the color of your stamp pad happens to be discontinued, you will be so thankful that you previously purchased the reinker as well! Some of my stamp pads are over 15 years old and still going strong. The pads are in great shape and have just had reinker added as needed. Whenever I buy new ink colors, I always purchase the reinker at the same time if possible. Thanks for stopping by! Be sure and stop by Dynamic Duos to see the other Design Team creations! a very elegant look Allisa... I bet the colors in real life are even prettier! Hello Allisa. This is so pretty and gorgeous colours. Love the design and the centrepiece is just wonderful. The gems set it off perfectly. I just love the clean crisp feel of your fab christmas card Allisa !! Thanks for sharing it with us this week at The Crafty Pad and hope you can join us again next week !! Love your Christmas card! Thanks for playing along with us at Eureka Stamps this week. What a pretty Christmas card Allisa, love that you used the colours for a non-traditional look. The new stamp set with the ornaments is super cute with the sentiments inside. Great job! Very nice. Great job, coloring the paper to get the color you needed. Beautiful card design! I love the image and the cuts you used. A truly lovely card. So happy you joined us this week at Holly Jolly Christmas Challenges! Allisa your card is beautiful!!! lot those ornaments... Thanks for joining us this week at CSAYL! Such a great CAS card! Thanks for playing at The Crafty pad this week in our To Die For Challenge! Sorry I'm commenting a bit late but life got in the way! Don't forget to check back on Thursday to see if you're one of our winners! Very pretty card. Lovely design. Thank you for joining us at Holly Jolly this week. This is beautiful!!! Love the purples!! And that bow is stunning!! Thanks for playing with CSAYL. 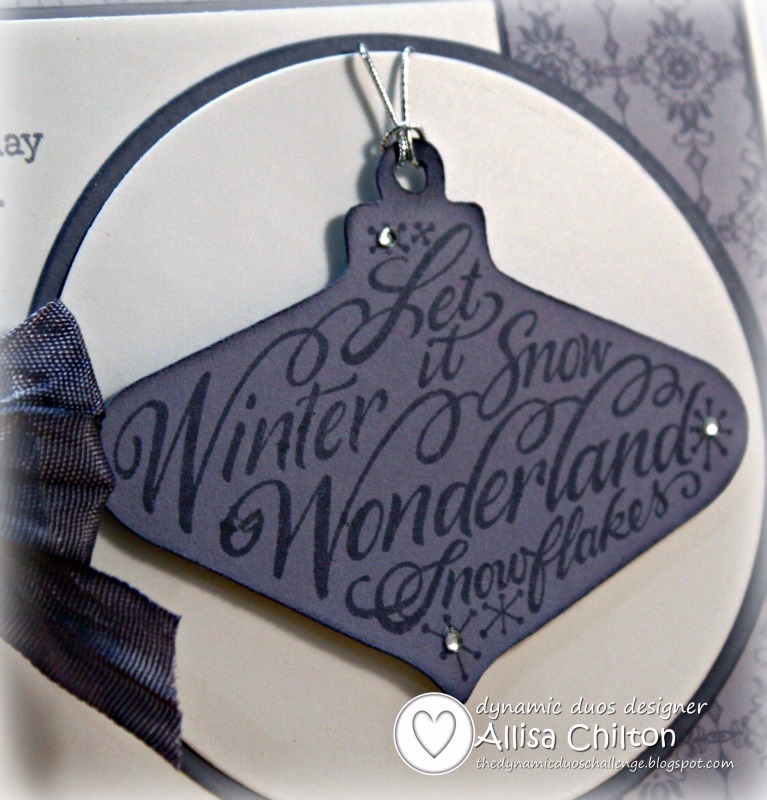 Allisa, another beautiful card and so pretty for Christmas. Great tip on the re-inker and would be prefect to get and than try the previous technique you showed us. Your blog is full of beautiful creations and great advise. Thanks!! Alissa, this is so pretty! You are tempting me from SU! Love the image you used for your pretty card Allisa, well done with getting Concord Crush so close with the re-inker. I always buy the re-inker when I buy a stamp pad, I have found sometimes that even a New stamp pad can be a little dry and needs to be topped up and it is ever so frustrating if you can't use it straight away. Such a fabulous Christmas card. This is just lovely! I never thought of using purples for a Christmas card, but it works so well. Beautiful card!!! Thanks for participating in CSAYL's challenge! Hope to see you again!! !